Totara Reserve Regional Park consists of 340 ha of native bush adjacent to the Pohangina River, north of Ashhurst. On various river terraces are podocarp dominated forest remnants, mainly kahikatea (up to 50 m tall) with some rimu and matai. Also of note are locations rich in mature totara. 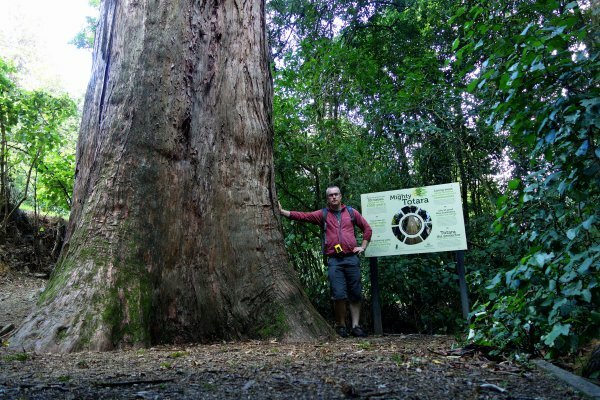 One of the largest totara in the park can be seen next to Churchill Drive, running through the northern part of the park (Smillie, 2014). From base of tree away from road, as there has been some fill on the road-side of the tree. An old, gnarly totara, with numerous dead branches, but plenty of live foliage. On the Nature Trail, about 5 minutes from the northern campground, or 2 seconds from the Churchill drive intersection with the track (the tree is immediately adjacent to the road).